Boiling water bath canning has been around for years and is a safe method of preserving high acid foods. Water bath canners are usually aluminum or porcelain covered steel that include the pot, a metal rack and lid. 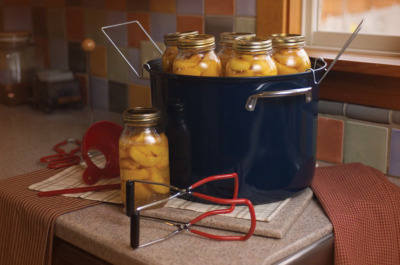 A canner can be found during the canning season in most hardware stores or food storage places. If you shop around you may find one at a garage sale for pennies or you might have a neighbor or family member that has one that is not being used anymore. They are fairly easy to come by. To ensure safe canning, the canner must be deep enough that at least one inch of briskly boiling water covers the tops of the jars during processing. Dome steam canners are also available to use for processing high acid foods but USDA does not recommend using them so they will not be discussed in this article. At the start of each canning season, check your canner. Make sure the enamel is not chipped or deeply pitted. If your rack has become corroded, you may want to submerge it in distilled vinegar to remove all of the hard water deposits. If it is too corroded consider replacing your rack, they are not much money. The boiling water bath method works by submerging your filled jars of food in hot water. The heat is transferred to the product by the boiling water which surrounds the jars. The food is then processed for a certain period of time. Following the recommended processing times ensures that molds, bacteria, or yeast have been destroyed. Only high acid foods such as fruits, jams, jellies or foods that have a pH of 4.6 or lower (pickles, sauerkraut, or relishes) can be processed in a boiling water bath canner. Most tomatoes and tomato products also fit into this category if acid is added to the food (lemon juice, citric acid, or vinegar). Hot Pack – The hot pack method is generally preferred when the food being canned is relatively firm and handles well. Precooking the food makes it more pliable, permits a tighter pack and requires fewer jars. Food is first cooked in brine, syrup, juice or water. Fruit canned without sweetening is always hot packed. The hot pack method is preferred for nearly all vegetables, meats, poultry, seafoods, and most fruits. In the boiling-water method, food that is hot packed usually requires less processing time than raw packed because it is already hot when it goes into the canner. Raw Pack – Foods that would be delicate after they are cooked, such as whole peaches, are usually easier to handle if they are raw packed. The food is placed into the jars while it is raw. It should be packed firmly but not crushed. Boiling brine, syrup, juice or water is added if additional liquid is needed. There may be some shrinkage when the food is processed, causing some foods to float to the top of the jar. 1. It is important to get as much of the air out of your packed jars as you can. Insert a plastic knife or a bubble remover in between the food and the jar. Press the food toward the center of the jar. You will see some bubbles float to the top. Rotate the jar about 3 times and continue to do the same process of removing the air. 2. Place your lids sit in simmering water for 5 minutes. This softens up the gasket so when the lid comes in contact with the jar rim it will create a good seal. 3. Place your lids and bans on your filled jars and finger tighten. 1. Fill the canner halfway with water. 2. Preheat water to 140 degrees F. for raw-packed foods and to 180 degrees F. (simmering with steam) for hot packed foods. 4. Prepare jars using the hot pack or cold pack method. 5. Tighten lids onto jars and place them into the canner rack with a jar lifter and use the handles to lower the rack into the water. 4. If the water does not cover the jars add more water so the water is about 1 inch over the top of the jars. 5. Cover with the canner lid and turn heat to its highest position until water boils vigorously. 6. Set a timer for the number of minutes required for processing the food. (Check tested recipes for specific times) Lower the heat setting to maintain a gentle boil throughout the processing time. 7. Add more boiling water if needed to keep the water level to above one inch of the jar lids. 8. When jars have been processed for the recommended time, turn off the heat and remove the canner lid. 9. Remove the jars using a jar lifter. Place on a towel covered surface, leaving a 1-inch space between the jars during cooling. Keep away from air drafts and let the jars cool at room temperature for 12 to 24 hours before checking the seal. 10. If any of the jars have not sealed place them in the refrigerator and use within 24 hours. 11. Before storing the jars remove the bands and wash the entire surface of the jar. Then store in a cool dark place. Canning is a great hobby plus it gives you a sense of accomplishment and a sense of security and is a great way to enjoy summer fruits during those cold winter months.